Also called the northern kiwi (as it is originally from Asia and Siberia), the hardy kiwi is harvested in autumn and winter. The fruit is very rich in sugar and vitamin C (400 milligrammes per 100 grammes) and contains many trace elements such as potassium, calcium, magnesium, iron, etc. It has the reputation of preventing fatigue which makes it a friend during the long winter months. The fruit (or berries) are smaller than those of the kiwi (about three centimetres) and have a smooth skin, but the two fruit are related. 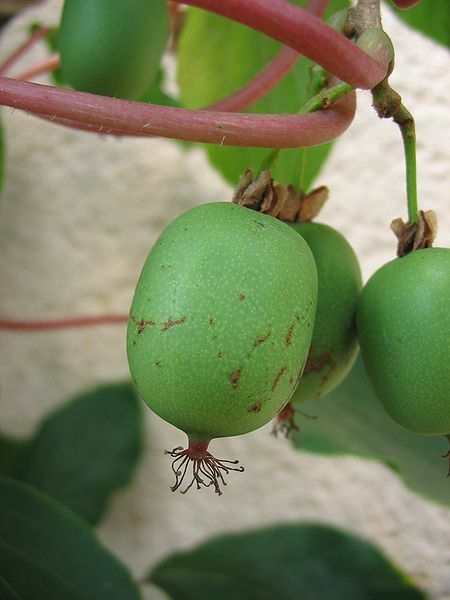 The hardy kiwi belongs to the species Actinidia arguta. Remove the fruit from the bunch and rinse them under running water. The size of a cherry, the hardy kiwi's smooth and green skin is edible and its flesh is milder and sweeter than that of the kiwi. In Asia it is used for medicinal purposes.